Custom Concrete Site Furnishings | Petersen Mfg. Co. Inc.
Petersen custom concrete site furnishings are manufactured in Denison, Iowa, and have representation in every state, Canada, Puerto Rico, Hong Kong, and Mexico by authorized Petersen representatives. Custom concrete site furnishings can be manufactured to your specifications to meet the needs of your project. Our design department can take your project ideas and actually show you how the finished product will look. It's a much easier way to make design decisions before the actual production begins, not to mention the savings on costly product samples. Petersen custom concrete site furnishings are reinforced with steel to create a durable product that will last for years with minimal maintenance. And since each precast concrete furnishing is built to your specifications you can be sure you will be satisfied with the design. Who uses custom concrete site furnishings? Petersen custom concrete site furnishings are frequently purchased by local, state, and federal government agencies, fast food restaurants, malls and shopping centers, schools, airports, parks and recreation departments, residential complexes, and many others including customers purchasing individual custom products to beautify their homes, patios, and gardens. Advantages of custom concrete site furnishings? Petersen custom concrete site furnishings offer maximum durability and minimum maintenance. The rugged steel reinforced construction makes them an ideal solution for outdoor use. Yet the gentle beauty, enhanced by a variety of color and texture options, offers versatility that will add aesthetic value to property – indoors and out. Create your own Custom Concrete Furnishings and provide us with the information neccesary to manufacture your dream furnishings. Imagine your patio with stylish tables, benches and planters that require little maintenance and are built to be weather resistant. 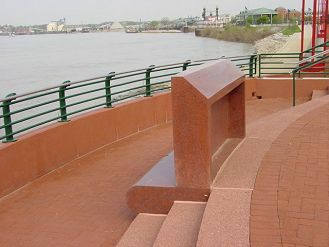 Quality Custom Concrete Furnishings by Petersen Mfg. are built to last a lifetime. How soon will I have my custom concrete site furnishings delivered? Petersen custom concrete site furnishings can be manufactured in a variety of sizes and designs, with a selection of color choices and textures for each. Petersen Mfg. Co. has multiple fiberglass and steel forms for all Petersen custom concrete site furnishings and will do everything possible to meet your needs for delivery times. Petersen Mfg. Co. builds all their forms in-house and will customize or design site furnishings to fit your needs. Once you decide on a Petersen custom concrete site furnishing and how many you need, Petersen Mfg. Co. will give you an estimated time for quick delivery.